Yes, this is a pretty awful picture, that's backlit and a 33 year old slide that hasn't lasted the test of time, taken with awful cheap equipment... it's taken about 2 hours to get to this because of all the scratches and dust and the fact it's been stored badly - some of my older ones I took as a kid were in the loft and have seen the emulsion split on the slides. Anyway, I still wanted to post it to tell a story. Like I said, it's about 33 years old, so brought back special memories from being a 13 year old - about the age my eldest son is right now. 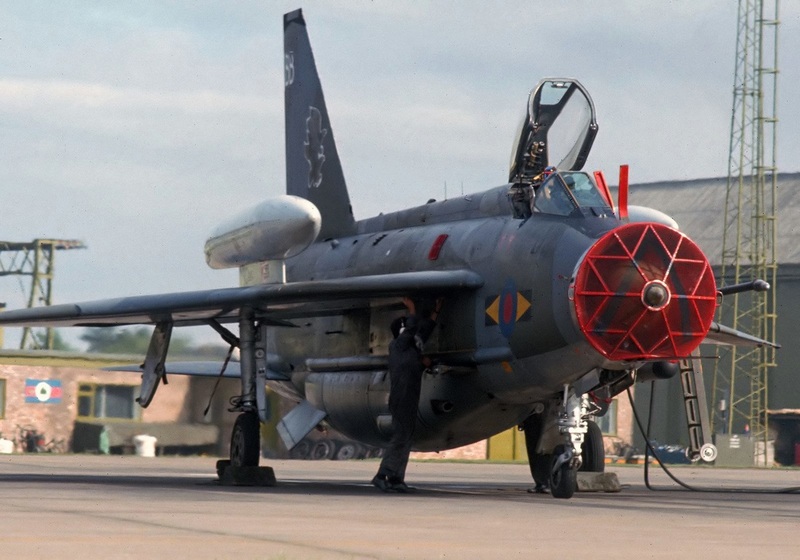 One Summer afternoon in 1982 at RAF Binbrook, I was standing at the fence with my 16 year old brother and no-one else was there that afternoon, my mother having dropped us off for the afternoon to watch the Lightnings. At that time, I had never seen a Lightning with Over Wing Tanks (OWT as we named them in our logs) and whilst we were there, the Bird Control Unit guy stopped at the crash gate in his LandRover and said, jump in! Imagine.... a 13 year old getting on the base, where he wasn't supposed to be - felt very exciting and kind of secret... we drove to the line and saw this... a Lightning with OWT on engine runs on the flight-line, hence the grill covering the intake, again something I hadn't often seen, as engine runs were normally done on the engine de-tuners on the opposite side of the airfield. We had to stay in the vehicle but shot it out of the back of the jeep through the open window and I felt very lucky to do this, as I had only been inside the base twice before! Now, I have been lucky to experience so many much better things but as a 13 year old, this for me was the mutts nutts... Being somewhere I wasn't supposed to be, or expecting and seeing something I had never seen before and to capture it too was special for me.... I couldn't wait that day to get home and tell my Dad all about it. And now he's 81 and not well but he keeps coming in my room to see what I have found and scanned and it was just very special to find this today to bring back yet more memories....I hope for those friends I have on here, who are a similar age to me, this scanning will be making some memories flood back and for those younger, at least it's a look back on those Cold War days.